Currently we are facing the water shortage in many parts of the world due to various reasons. Many regions are continued in dry state for many years and access of clean and potable water is a dream for them. Drought caused by climate change is leading to reductions in the availability of fresh water supplies in some regions. This is having an impact on agricultural production by limiting opportunities for planting and irrigation. Fogs have the potential to provide an alternative source of fresh water in dry regions and can be harvested through the use of simple and low-cost collection systems. It’s composed of extremely small water-droplets (ranging between 1 µm to 40 µm) and is very similar to clouds, except its base is on the ground. Fog water collection has emerged as an innovative technology for mountainous communities without access to traditional sources of water. 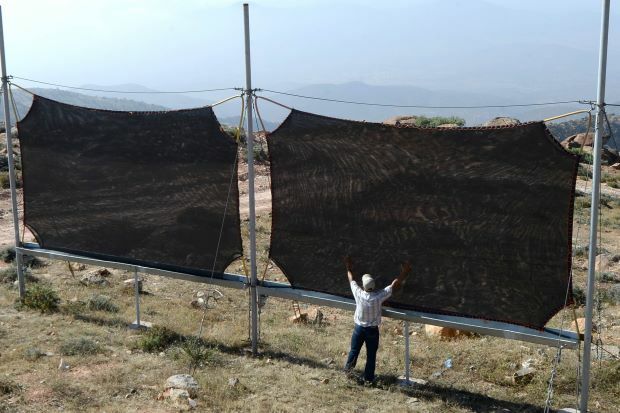 Fog harvesting technology consists of a single or double layer mesh net supported by two posts rising from the ground. 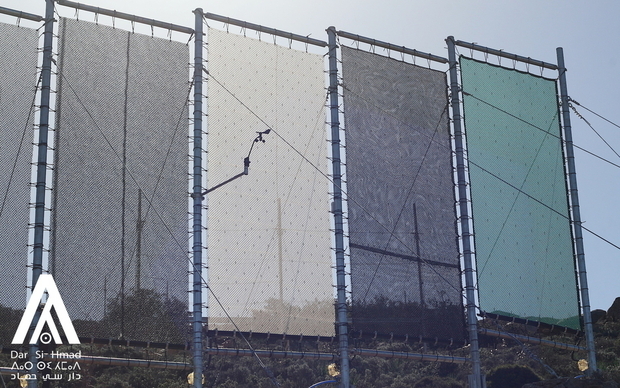 Mesh panels can vary in size. The collector and conveyance system functions due to gravity. Water droplets that collect on the mesh run downwards and drip into a gutter at the bottom of the net from where they are channelled via pipes to a storage tank or cistern. Atmospheric water is generally clean, does not contain harmful micro-organisms and is immediately suitable for irrigation purposes. 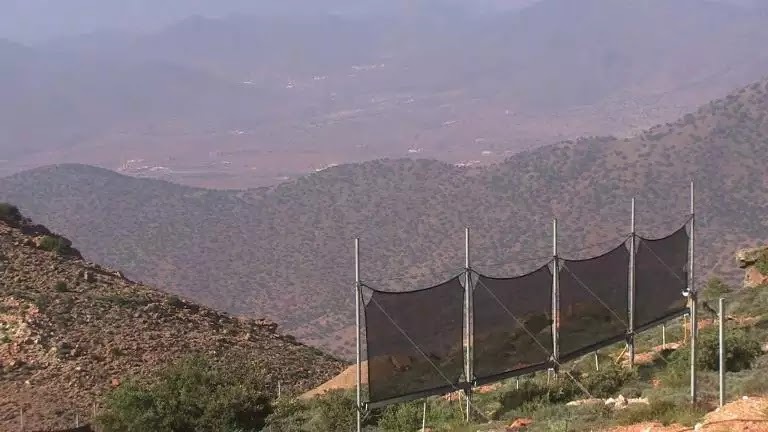 One such fog harvesting has been carried out at Boutmexguida mountain in Southwest Morocco where villagers no longer need to walk miles for fresh water. Dar Si Hmad promotes local culture and creates sustainable initiatives through education, the integration and use of scientific ingenuity with the communities of Southwest Morocco. Families in the region have started to benefit from fog harvesting – a technique first used in Chile over 20 years ago that is now also being used in Peru, Namibia and South Africa. With the pipes laid down, potable, safe, and fog-harvested water will be delivered to the inside of households, relieving the population from the task of fetching water and creating potential for further development in the region. “Morocco has a lot of fog because of three phenomena: the presence of an anticyclone from the Azores [north Atlantic islands], a cold air current and a mountainous obstacle.” Derhem says, as reported by The-newshub.com. With the new fog harvesting technology, people could collect about 7,000 litres of water from fog costs 3 times less than before. FogQuest describes the annual average water-collection rate of 5 L/m2 as a potentially positive value. 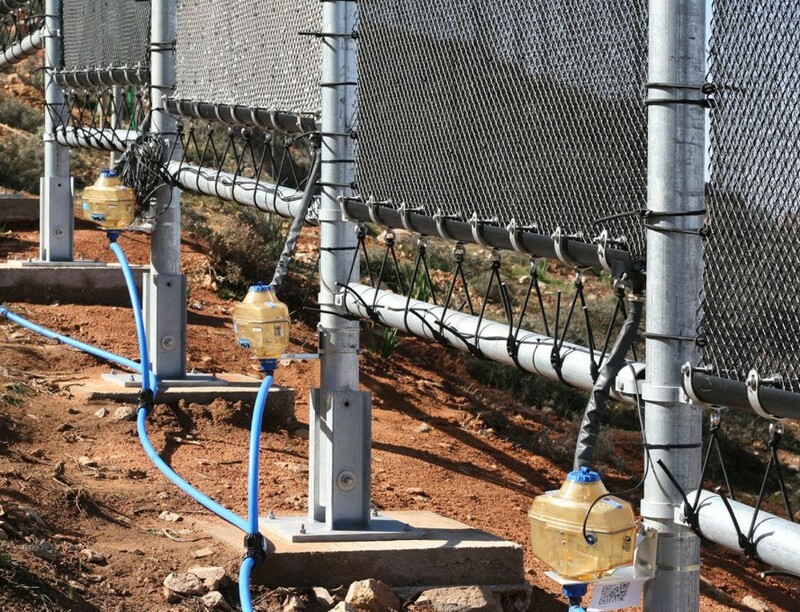 The measuring occurs through the installation of Standard Fog Collectors (SFC), which are 1 m 2 of mesh, and their daily monitoring for at least a full year.